LONDON: “The entire Sikh community considers Pakistan as their only sincere friend and they are thankful for support for their cause. We are very grateful the way the Pakistan Government looks after Gurdawaras and extends facilitation to Sikh pilgrims in Pakistan”. 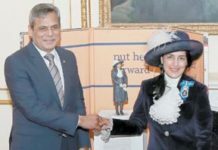 These sentiments were expressed by a delegation of Kar Sewa Committee Sikh Gurdham (UK) led by Joga Singh, General Secretary who called on Pakistan High Commissioner Mohammad Nafees Zakaria at the high commission on Tuesday. The delegation paid this visit in order to convey their gratitude to the people and Government of Pakistan for the arrangements of upcoming event of 550th Birth Anniversary of Baba Guru Nanak. 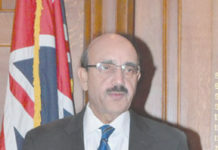 A spokesman for the delegation told ‘The Nation’ that the delegation praised and thanked Government and people of Pakistan for restoration, maintenance and upkeep of Sikh sacred as well historical sites in Pakistan.“We have written to Prime Minister Imran Khan, pledging assistance in organising events linked to the forthcoming 550th birth anniversary of the founder of their faith. Amidst worrying regional tensions, the move will be seen as a welcome contrast to the events of recent weeks in South Asia”, he said. Sri Guru Nanak Dev Ji was born in 1469 in the place now named after him, Nankana Sahib in Punjab, Pakistan. Sikhs around the world will mark the event in November this year in a big way, but Nankana Sahib will be the focus of this significant milestone in Sikh history. Thousands of Sikhs from across the globe will be attending the celebrations there and at other historic Sikh shrines and heritage sites in Pakistan. The Sikh delegation offered expertise and a coordinated approach on a range of logistical matters, such as the provision of adequate accommodation for visiting devotees. For his part the High Commissioner sought feedback on issues such as the operation of the religious pilgrimage visa system which will be key factor to facilitating the entry of large numbers of Sikhs from abroad. The letter to the Imran Khan expressed deep appreciation for his Kartarpur corridor initiative and requested further investment in the burgeoning Sikh-Pakistan relationship by way additional renovation work on Sikh shrines in Pakistan. Specifically mentioned was a request for enhanced facilities at Gurdwara Punja Sahib in Hasan Abdal. The delegation briefed the High Commissioner of the Sikh nation’s desire to broaden and deepen its links with its vast heritage in Pakistan; it is a sentiment so powerful that it features in their daily prayers. 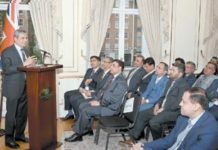 The High Commissioner assured the delegation that as per past practice, the High Commission will extend usual courtesies and assistance to the Sikh Yatris. He briefed the delegation on investment and business opportunities that existed in religious tourism and infrastructure development. He said that the Government of Pakistan would continue to engage positively with Sikhs in enthusiastically commemorating the Guru’s birth in a special manner this year, just as it had already taken the lead in inaugurating the highly acclaimed Kartarpur Sahib corridor project. In order to show Pakistan’s message of universal peace, egalitarian brotherhood, social cohesion and religious harmony, the High Commissioner invited the delegation to visit all the Sikh historical places and share their experience and sentiments with the Sikh Diaspora around the world.